3.8 out of 5 based on 192 bloggers and 73 commenters. 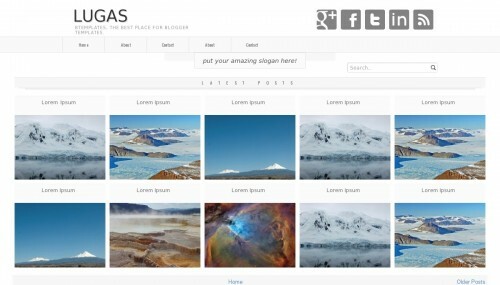 Lugas is a free blogger template with 2 columns, right sidebar, gallery-styled, footer columns, social bookmarking icons, posts thumbnails, related posts support and neutral colors. how do I change the color on header ? I have a big problem with the post thumbnais.. In the Lugas Demo there are 3 rows of 5 post (total 15) but I have only one row of 5!!! I have planned on Post Setup to display max 20 post for the page…. I am desperate, because it does not work??!?!?!? Did you ever find out a solution? I’m having the same problem. Home page only displays 7 posts instead of 15. Very frustrating as the blog doesn’t look complete/professional. If I could even get to ten it would be something as would have two even rows then. Thanks for this nice gallery Template. I am using the Lugas template on my blog but cannot seem to display any more than 4 updates on the main page. Any idea how to display more. I have changed the settings to 10 but it doesn’t seem to work. If you have a very long blog post, be sure to include a pagebreak somewhere near the beginning; this will prevent the situation where you don’t get all your max posts to appear on the first page. The thumbnail is the first image that is *uploaded* to your blog. It won’t work if you link to a URL; it seems you have to upload it. I’ve customized the template quite a bit and removed some of the excess chrome. I’ll be happy to share how I did that if anyone is interested. All my posts have images but they don´t show, you know why? I’m having the same problem. Home page only displays 7 posts instead of 15. Appreciate you could help me to solve this problem. Hope to here from you soon. Thanks. I am also having troubles with the thumbnails in the homepage. Some are appeearing others do not. I tried editing the html codes in the blog post, but still got no success. Hope you can help me with this. I’m having the same problem. Home page only displays 7 posts instead of 15. Please help. Tengo el mismo problema. Primero aparecía 8 entradas en el home y ahora aparecen 5. Alguien lo solucionó? Ayuda por favor. I have the same problem. First 8 inputs on the home and now appear 5. Someone solved it? Please help. How can I change the hight of images? I want hight=width. Anybody can helm me? And the replace the 128 with the size you want. Maybe some CSS needs to be adjusted.